Kids' Book Review: Review: Hi! Author and illustrator Ethan Long has created a fun board book for littlies featuring a series of cute, friendly creatures. Hi! has a long line of different animals to introduce children to - there are thirteen in all. 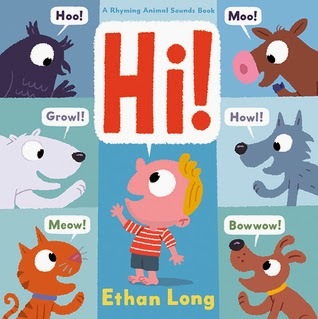 It’s a perfect book for teaching toddlers about different animal noises, and to explore the concept of saying ‘hello’, or in this case, the less formal ‘hi’. As a young boy starts his day, an owl says good morning with a Hoo! Each page then features a single animal, each with their distinctive greeting. It includes the more traditional animals like a dog, cat, and cow, but more unusual animals are present, too. Animals like a wolf (Howl! ), an anteater whose snout is stuck in an ants’ nest (Slurp! ), and a donkey jumping excitedly (Hee-haw!). The sounds are paired together across pages so rhyming greetings are adjacent. For example, the cat’s Meow! is followed immediately by the dog’s Bow wow! This adds another dimension to playing with the sounds. After each of the animals has said hi, a double-page spread with pictures of them all gives children the chance to identify them and practice the different sounds. It’s followed by another page where the little boy practices his own greeting with his mum. A short, simple story to enjoy at any time of the day.